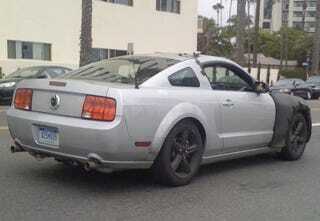 A member of Mustang fan-forum StangNet caught this camouflaged mule last week in Santa Monica. While the back end looks straight 2009, we're told it may be a powertrain tester for a possible "Boss" V8-powered 2011 Ford Mustang GT. 2010 Ford Harley-Davidson F-150: Who&apos;s The BOSS? While the rear appears to be a standard mk1/2009, the front end used modified 2010 bodywork with additional venting in the middle of the hood and what appeared to be a slightly different front valance. What can't be seen is the rumble — Far deeper, far louder than a standard GT. While it's possible that it's a powertrain mule for a Shelby or mid-range "Boss" variant, the standard GT brakes would lead me to believe it's 2011's new V8. Who&apos;s The Boss: Ford To Axe Boss Engine In Mustang, Limit Use To Super-Duty?